I like finding old cars to photograph. 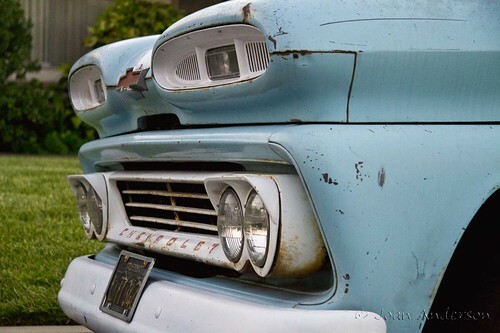 They seem so much more solid than the cars of today and they have more character. Although, I imagine, driving this big guy would take a lot more effort than my current car with its power steering and electric everything. "The one thing that unites all human beings, regardless of age, gender, religion, economic status or ethnic background, is that, deep down inside, we ALL believe that we are above average drivers. ~Dave Barry, "Things That It Took Me 50 Years to Learn"
According to Wikipedia, McDonald's "introduction of the 'Speedee Service System' in 1948 established the principles of the modern fast-food restaurant." This Speedee at the oldest surviving McDonald's must be nearly 60 years old now, and apparently is in need of some minor repair work. This McDonald's location was listed on the National Trust for Historic Preservation's 1994 list of the 11 Most Endangered Historic Places. See Speedee McDonald's for more pictures from a previous Downey Daily post. Albertson's makes buying things so easy. The displays are so beautiful, I want to pick up everything. 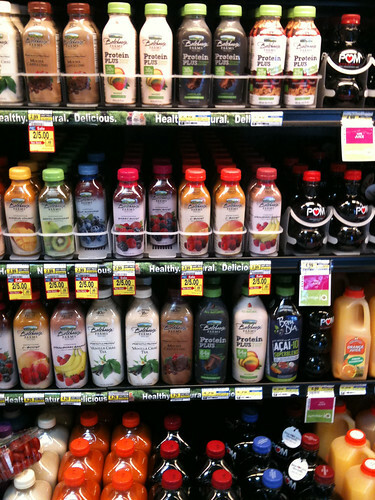 These Bolthouse juices are set perfectly to tempt the passerby to grab one more delicious item on the way to the checkout. IPhones have a fun advantage. These pictures are as I am hurrying past on my way to work. 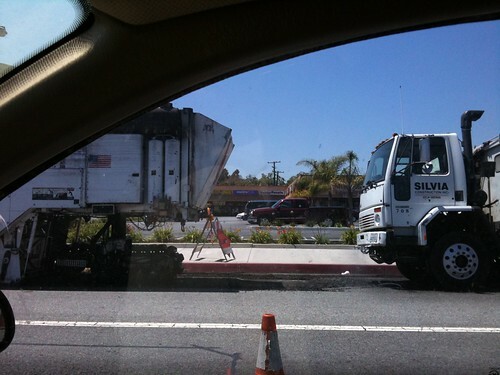 They are working on yet another part in Downey on Bellflower Blvd. 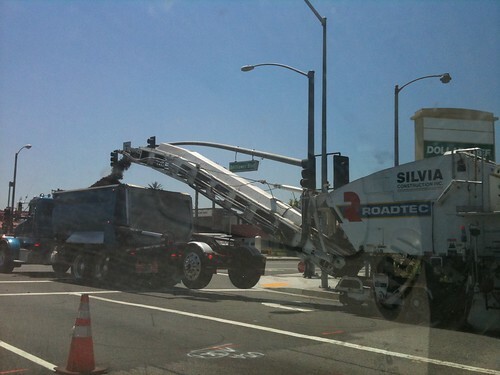 I thought the machines were so cool that ripped up the concrete, chopped it up into tiny pieces and threw it in to another truck. 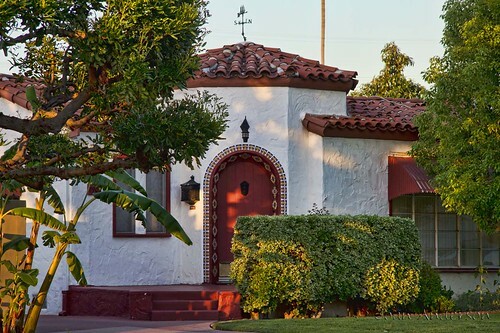 I appreciate the variety of older homes found in Downey. 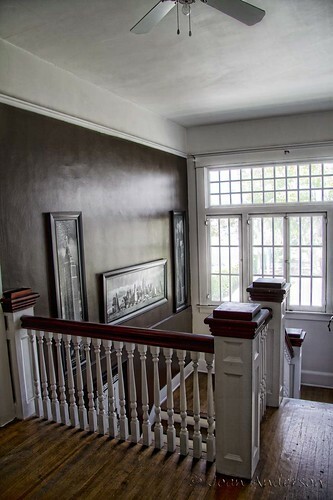 According to Zillow, this one was built in 1931. Spanish style is one of my favorites. This one has some beautiful details. I love the door! I've been reading a lot lately about not letting rain ruin a photo shoot. Rain can add a wonderful dimension to pictures, if you just change your focus a little. So when it started raining yesterday morning, I thought, "What would make a good picture in the rain?" 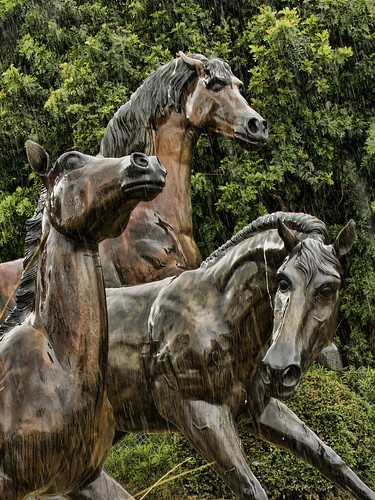 It turns out that rain is very flattering to statues, especially horses. These statues are on Firestone Blvd., the main thoroughfare through Downey, just before you enter the city from neighboring Norwalk. According to the plaque, they were created in 1999 by Snell Johnson, and they're called "Spirit of Progress." I can't find anything on the web about the statues or the artist. Maybe somebody out there can fill me in? 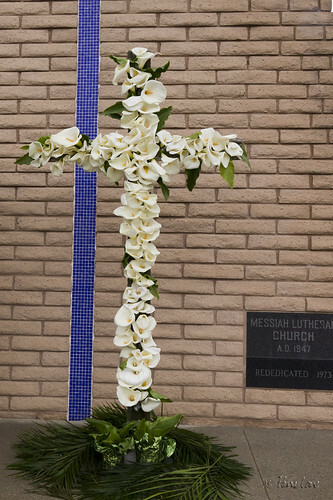 This morning, the Messiah Lutheran Church acknowledged Easter with a beautiful cross made of Easter lilies. 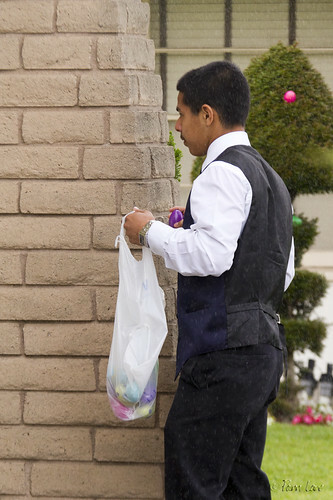 Around the corner, preparations were underway for the the kids' Easter egg hunt. Today was the first day in many years that we have had rain on Easter (you can see the raindrops against his suit if you look closely), but it didn't stop the hunt. A blessed Easter day to all! 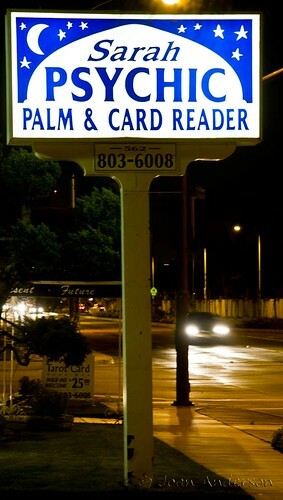 I guess every town has a palm reader. I have never been, but I have driven past this building over the years. I have to admit, I kinda wonder if she's a little like Shawn in "Psych." 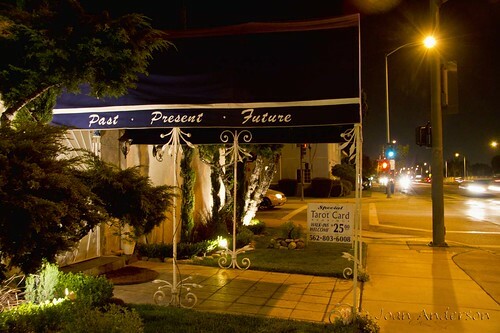 Porto's Bakery not only brought crowds to downtown Downey, they also brought the only valet parking garage. 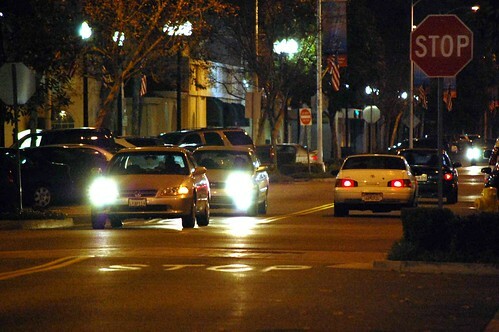 For $4, you can avoid having to drive around and around the parking structure looking for an empty parking space. Or, heaven forbid, you could park on the street and walk off those tasty Cuban pastries! 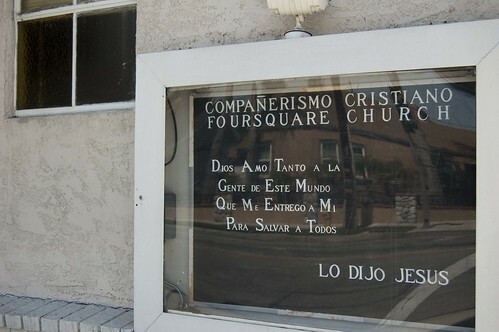 I wish I knew Spanish a little better so that I could visit this church. 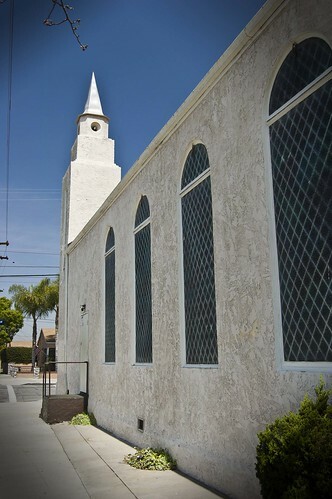 It's in the Southern part of Downey and isn't that big but I pass it every day going to work and I wish I could visit this beautiful church and learn more about its history. Okay, so this is not in Downey. 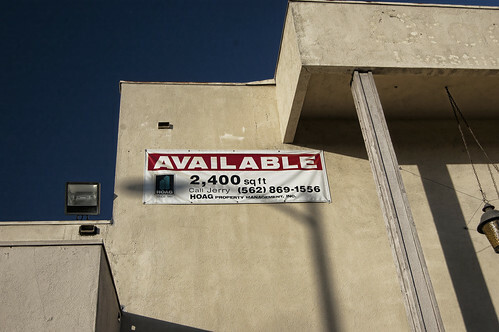 This is in downtown Los Angeles (which is close to Downey). The view is from the roof top of a condo building on Lafayette Park Place. I've been spending more and more time in downtown with my daughter, who is looking for a condo in the area. There is so much beauty in this city of contrasts. 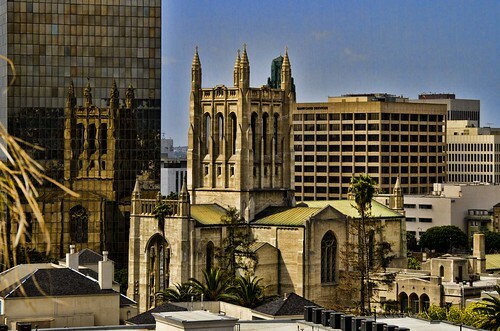 This beautiful old church is surrounded by all these newer buildings. Looking at the map, I'm guessing this is the First Congregational Church of Los Angeles, built in 1867- but I don't really know that for sure. I guess I'm going to have to go back again and check it out- this time from street level. I know Joan has shown this scene before. 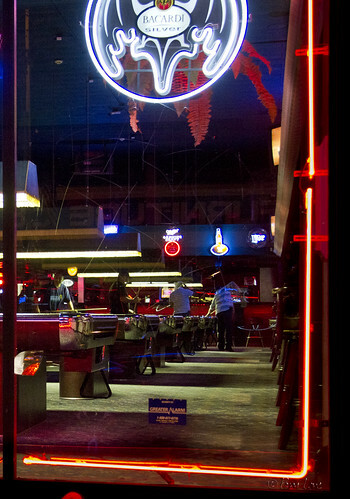 But there's something appealing about the neon, the low overhead lights, the rows of tables. Oh, and I used to work in this building when it was a Sears catalog store. My very first real job, just 40 years ago. 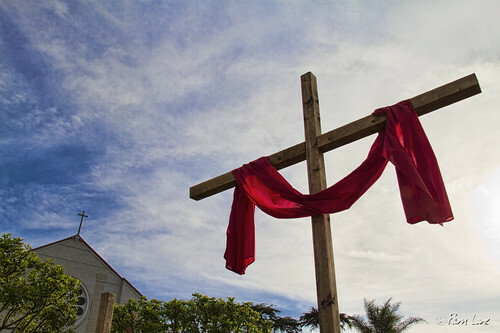 This weekend, volunteers set out three crosses in front of the Our Lady of Perpetual Help church and draped them with red cloth in preparation for the Easter celebration next Sunday. I don't know much about this house, but I like the front door. According to sources, it was built in 1923. The sad part is its location. It is right next door to the 5-story Bank of America building. 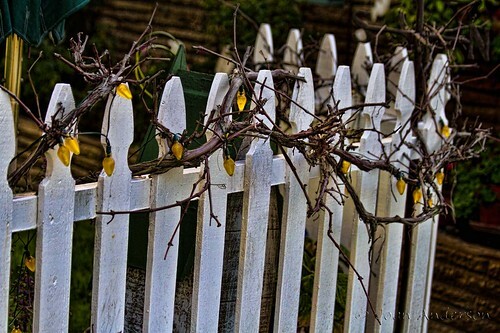 It's not where I would choose to live, but the charm of the house is undeniable. 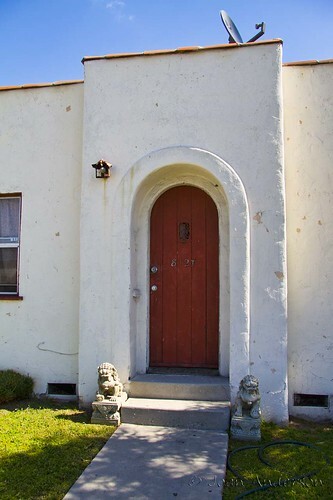 Even the little Chinese lions on either side of the entry give it an extra kick of character. 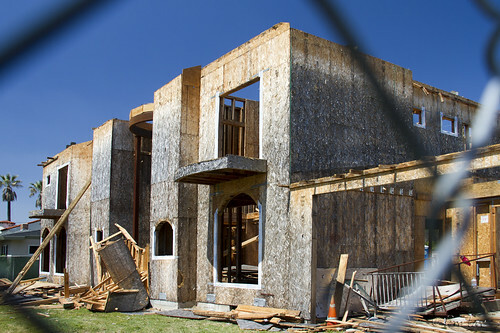 For several months, I watched this house being built. It got far enough along so that you could get a glimpse of the dream that the owners had for it. Then for a couple of years, I watched the plywood get more and more weathered. I wondered what happened to the dream. Now I'm watching it come down again. I assume that it's coming down because someone else is planning to build here. I wonder what their dream house will look like. I had every intention of posting a picture of something else today when, on my walk today, I saw this in a someone's front yard. I had to take a picture of it. I've never seen anyone do this before and I was wondering what the reason was. I can really start to feel summer coming when I walk the street of downtown (yes, one). The cars and pedestrians seem a little more alive. The day stays light longer so the night feels early and lighthearted. Maybe it's the novelty of being able to be walking in T-shirts in the middle of the night. Or remembering summers of vacation from school. Whatever the cause, people seem happier, calmer, and relaxed. I love this time of year. It had been a while since we visited the Rives mansion. So, Saturday we stopped by to see if we could wander around again. We were in luck, the door was open and Oscar was there. Climbing to the second story, I found myself wondering how many people over the last hundred years had climbed that same wide staircase. There is such a sense of history here. I finally had a chance to see the "ballroom." It is a large room lit by tons of natural light. 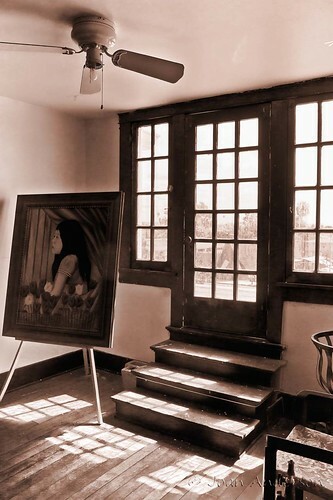 In fact, what I noticed most on this visit was the enormous amount of natural light in the house. 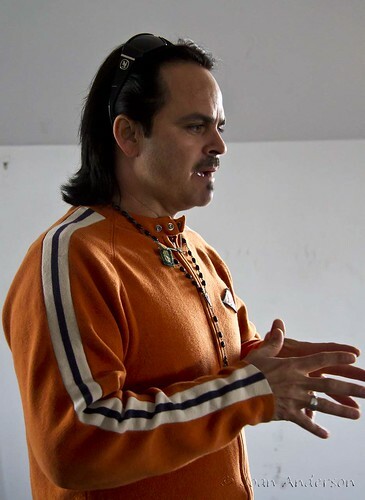 As we visited, Oscar shared some of his thoughts about the future of the mansion. Oscar and Carmen have made progress on the place. They have continued to paint, adding color to some of the walls. See previous post of this same landing from January. Of course, more posts to follow. He says: "Here, let me help you." He says: "Maybe if I push from behind." 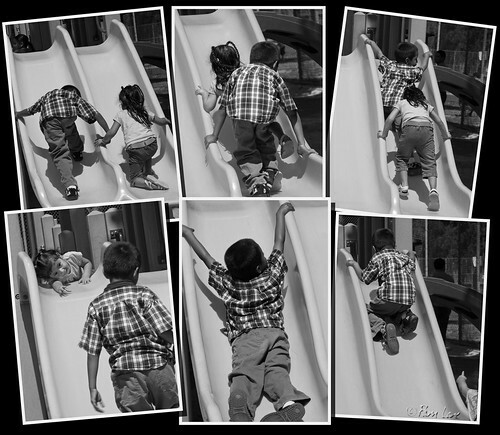 He says: "Just follow me up." She says: "There's another way up." He says: "No, really, just follow my example." She says: "Here, let me help you." My mom has been bugging me for a while, "What about our old church?" 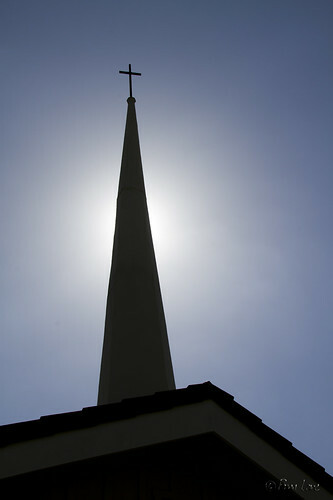 So today, I stopped by what is now Downey First Church. When I was growing up, this was Grace Baptist Church. There's a main street in Downey called "Old River School Road," and apparently there actually was an old River School. I'm told that this schoolhouse became the sanctuary for Grace Baptist. When I was still in elementary school, the church built a beautiful new sanctuary, and the old schoolhouse became our fellowship hall. This afternoon, I met Charlie Koo, the English Ministry Pastor. When I explained why I was there, he welcomed me to look around and take pictures. 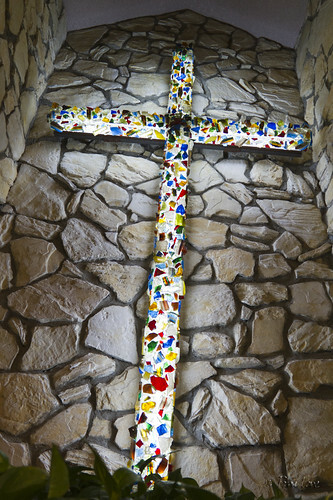 The sanctuary looked much as I remember it, with the cross in the baptistry (above). But everything else was different. I hunted and hunted through my old photos for some pictures to show you, but couldn't find a thing. 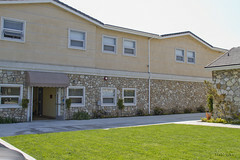 Charlie explained that a fire a couple of years ago led them to tear down the old schoolhouse building and replace it with a new facility (left). 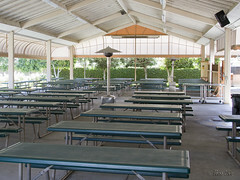 And the old "Fireside Room" and kitchen was completely gone, replaced by this open-air eating and social area (right). While I was inside taking pictures, I met Julian (standing, on the left), an aspiring videographer. He's a Downey Daily Photos subscriber, and he soon made me feel like a minor celebrity. 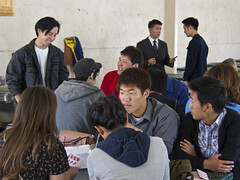 The service that had just ended is made up almost entirely of college and professional young people, who were now lunching together and enjoying each other's fellowship. Julian and the others invited me to join them for lunch, and I had a great time talking with them and getting to know a little bit about them. Thanks, everyone, for reassuring me that while some of the buildings are gone, the Spirit is still there. 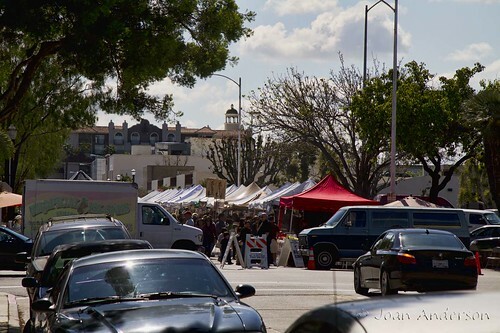 This morning we went to the Farmer's Market on 2nd Street. It's such a fun place to find produce and snacks of all kinds. One of my favorite places is the pupusa stand. 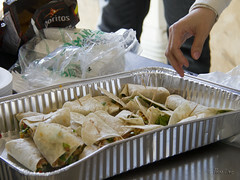 They make them fresh while you wait—it takes about 5 minutes. A pupusa is a traditional Salvadoran dish made of thick corn tortilla (handmade using masa de maze) and filled with beans, cheese, and meat if you want. It's served with something similar to a cabbage slaw and salsa. It's one of my favorite breakfast snacks. 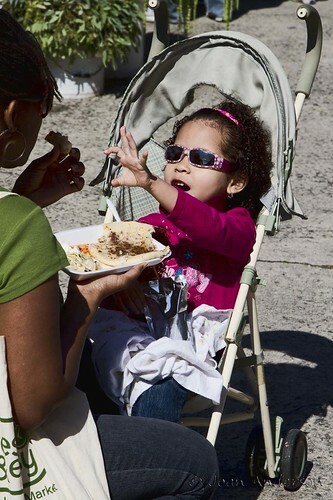 This little girl seemed to be enjoying it too! 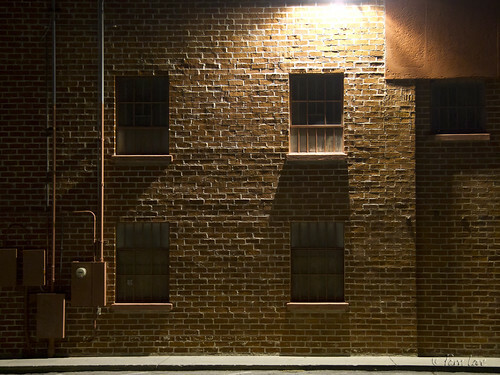 A single light in an empty parking lot. What could feel lonelier? One of my favorite walls (see this post) has an eery feeling late at night. 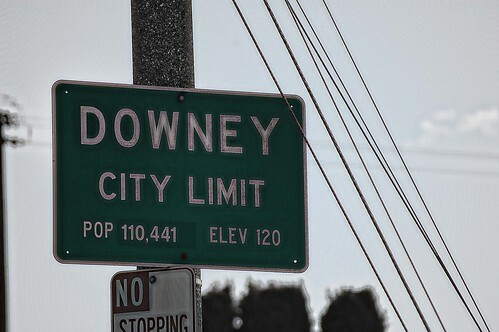 I just thought it would be fun to see a different side of Downey. From my roof. 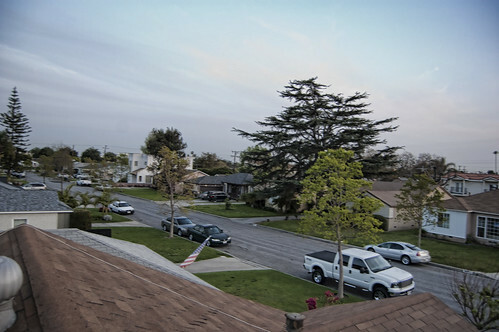 I guess this is how the perched birds see our suburbia. It's spring time and I love the fact that the days seem so much longer because it doesn't get dark until 7:30. 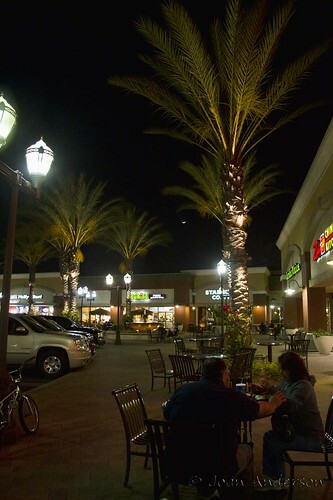 Wandering around Downey Landing tonight, I noticed quite a few people out enjoying the longer days too; eating late dinners and snacks outside by the food court area. 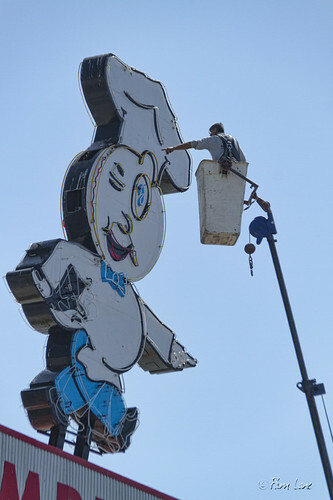 Not far from where I grew up, there's a building with a big banner saying "Knights of Columbus BINGO Tuesday nights." I don't remember ever seeing a different banner, or ever seeing any people there. 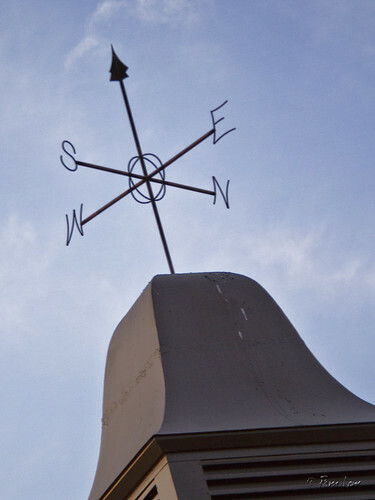 The building is totally nondescript—but I did like their weather vane. So I was curious. What are the Knights? It turns out that the Knights are the world's largest Catholic service organization. Named after Christopher Columbus, the Knights were founded in 1882 to provide for widows and orphans. Famous Knights include John F. Kennedy, Vince Lombardi, and Babe Ruth. In 2009, the Knights gave more than $151 million directly to charity and performed over 69 million man hours in volunteer service. There must be something going on in that building! I know, I'm back to yard art. I just can't seem to resist it. 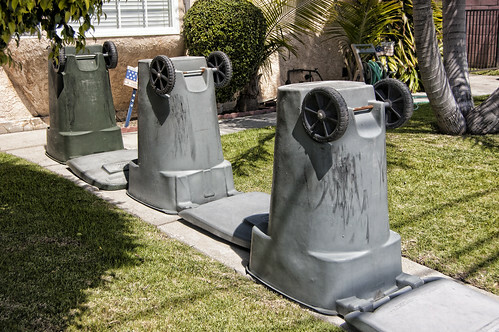 I have shared yard art from this house before. I find their yard fun and just a little bit funky. 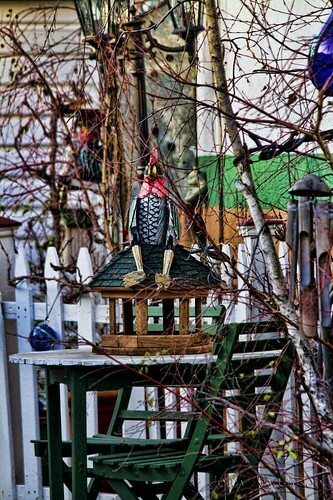 The front yard has a quirky character that I love. I have a couple more pictures I want to show you of the views from the Embassy Suites Hotel, one for today and one for next week. 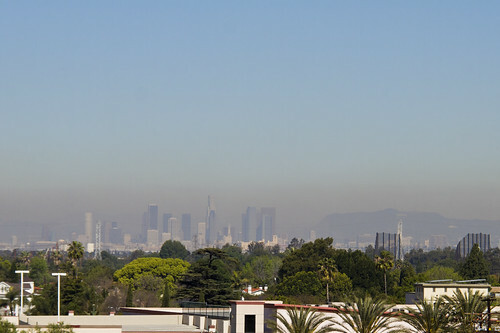 Today's picture isn't very exciting, but it illustrates one of the problems that is synonymous with Los Angeles—smog. Smog was an issue in this area long before cars arrived. The name given to this area by the Chumash tribe of Native Americans translates to "the valley of smoke" because of the smog from native campfires. Part of the problem is that the smog has nowhere to go and very little rain to wash it away. Los Angeles lies in a basin, surrounded by the ocean on one side and mountains on the other sides. 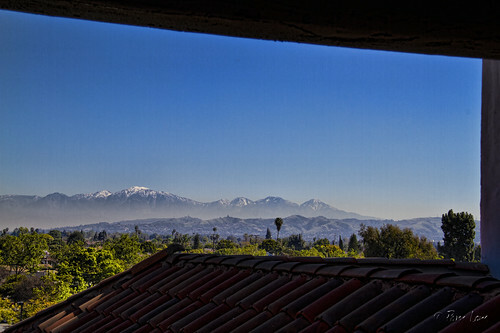 These mountains, along with a variety of other geographic and weather conditions, hold our smog in. You'll notice that the higher you look, the bluer the sky is. On a day like today, with relatively mild smog, you don't even realize the smog is there until you see it in the distance.